On Wednesday evening, 27th February, Commonwealth Rower and former Royal Marines Commando of the British Army, Mr. Richard Allen arrived on the shores of Guyana after rowing for approximately 3,000 miles across the Atlantic Ocean from Freetown, Sierra Leone in West Africa. This is an incredible achievement showing determination and courage on his part. His journey is about raising awareness of the Commonwealth and to draw people from around the Commonwealth together in order to achieve one common goal, that is people helping people through health, education and enterprise. His boat, named “Tamu’kke’ is the Patamona language of the Indigenous people of Guyana, meaning "Together or United." Mr. Allen reached out to the Guyana Foundation in 2018 to request their collaboration on this mission. On his arrival, he was welcomed by Founder of the Guyana Foundation, Supriya Singh-Bodden, CCH, British High Commissioner to Guyana, H.E. Gregg Quinn, British Security Advisor to President David Granger, Retired Lt. Col. Russel Combe, Trustees of the Guyana Foundation as well as his parents who travelled all the way from London. The following morning a brief welcome ceremony was held on the Marriott Beach at the Kingston Seawalls. Attending were children and teachers from the J.E. Burnham Primary, St. Margaret’s Primary, North Georgetown Primary, Providence Primary, St. Gabriel’s Primary and West Ruimveldt Primary, who were following his voyage online. Also present were government officials and other persons who were very interested in his journey. Gifts and tokens were presented to Mr. Allen by some of the schools and Mrs. Geneva Ross-Tyndall of the Ministry of Foreign Affairs. Educational packages were distributed to each school. 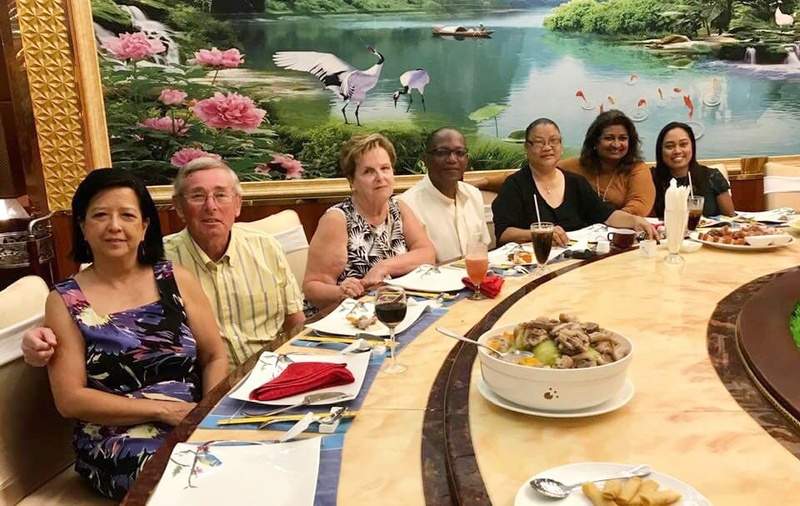 A dinner hosted by Mrs. Che Jian Ping, a Trustee of the Guyana Foundation, was held in his honour on the evening of Thursday 28th February, at the New Thriving Chinese Restaurant. On Friday 1st March, Mr. Allen accompanied by the Guyana Foundation team along with Ms. Krystyna Wojnarowicz, an official of the Canadian High Commission in Georgetown, Mr. Neil Bacchus, Chief Executive Officer of the Indigenous Peoples’ Commission and his parents, travelled to the Sunrise Center at Zorg-en-Vlygt on the Essequibo Coast. They were welcomed by the Managing, Ms. Meena Upeacehan, staff, volunteers, facilitator of the Center, Ms. Jem Britton and students of the Cosmetology class. In her brief remarks, Ms. Supriya outlined the aims and objectives of the Foundation and the positive effects it has had on the lives of thousands of people. Mr. Allen in exchanges with students gathered at the Sunrise Center, spoke about his journey and there was much excitement among everyone gathered there. The team then visited Abram Zuil Secondary School where Mr. Allen shared his journey and experiences with the Forms 4 and 5 students. They were amazed at his accomplishment and they asked many curious questions about his life during the journey and how he managed to survive those three months. The next stop was at Fisher Primary School where the team was introduced and had discussions with the headmistress, Ms. Roopdai Gangoo, teachers and some of the pupils from the Sunrise Center After-School programme. The pupils were happy to meet with Mr. Allen after been told about his amazing voyage. A visit was then made to Nateefa John’s home in Onderneeming Sand Pit, Little Red village. Nateefa is a young lady who had completed a cosmetology program with the Guyana Foundation Sunrise Center and is currently offering this service to her community. She is presently engaged in construction of her own salon. The final stop was Mashabo, an Indigenous village across the Ituribisi Lake, also known as the “hot and cold” lake. They were welcomed by Toshau, Mr. Sylvian Raphael on their arrival. He discussed some of the difficulties facing his village with the visiting team. Mr. Allen was invited over to the community center where he observed a Guyana Foundation programme in progress. Ms. Abiola Garraway, a facilitator of the Guyana Foundation was engaged in a fabric design course. Students were able to show off beautiful hand crafted materials. The visiting team also took the opportunity to buy craft from the villagers. Ms. Supriya made an offer to purchase 200 tie-dye fabric beach wraps for her shop in the Cayman Islands. 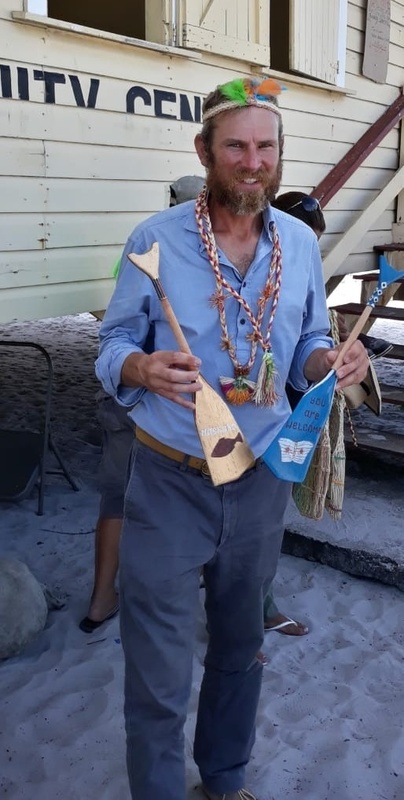 Before departing Mashabo, Mr. Allen received two hand decorated mini oars from the Toshau as tokens for the oars he broke on his journey across the Atlantic. He was overwhelmed by the hospitality, generosity and kindness of the Guyanese people. 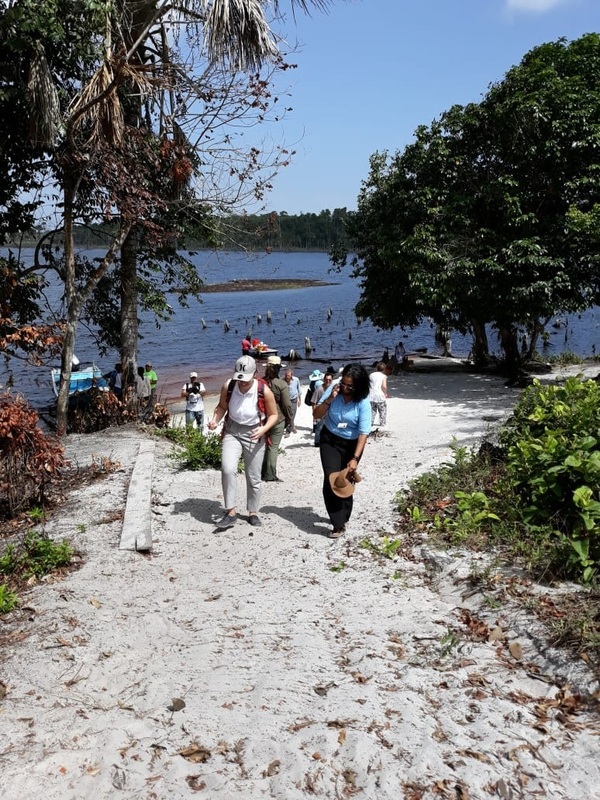 The Guyana Foundation Team along with Richard, his parents and others arriving at Mashabo on Friday 1st March 2019. Richard being welcomed by residents of Mashabo at the Community Center. Richard being presented with two mini oars by Toshau Slyvan Raphael of Mashabo. Richard with his token of two mini oars. Richard speaking with the women of the Fabric Design Programme spnsored by the Guyana Foundation at Mashabo. Arriving at the Sunrise Center. Mr. Roger Allen, Richard’s father on his arrival at the Sunrise Center. Mrs. Sheila Allen, Richard’s mom and Mr. Neil Bacchus, CEO of the Indigenous Peoples’ Commission on their arrival at the Sunrise Center. Briefing session at the Sunrise Center on the arrival of the team. Very interested at what the students of the Cosmetology class is doing at the Sunrise Center. Ms. Krystyna Wojnarowicz of the Canadian High Commission in Georgetown. Ms. Jem Britton, Facilitator of the Sunrise Center speaks with Founder, Ms. Supriya Singh-Bodden. Commonwealth Rower, Richard Allen with students and facilitator, Ms. Jem Britton (6th from right) of the Cosmetology class at the Sunrise Center. With students and teachers of the Fisher Primary School. Talking to students of the Abram Zuil Secondary School. Students of the Abram Zuil Secondary School. Mrs. Geneva Ross-Tyndall of the Ministry of Foreign Affairs presenting Richard with a gift. 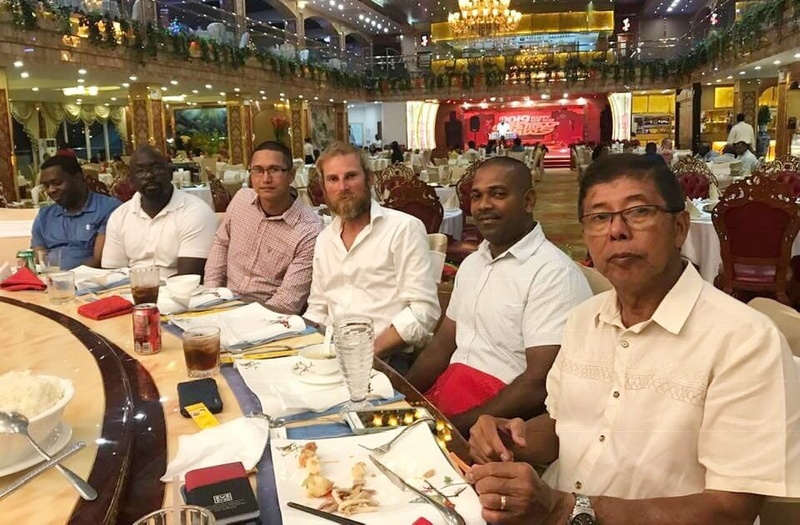 Richard with the Founder of the Guyana Foundation, Supriya Singh-Bodden and Trustees, Mr. Eric Philips, Mrs. Che Jian Ping and Mr. Stanley Ming. At the Marriott Beach with students of J.E. Burnham Primary School. At the Marriott Beach with students of the West Ruimveldt Primary School. At the Marriott Beach with students of the North Georgetown Primary School. At the Marriott Beach with students of Providence Primary School. At the Marriott Beach with students of St. Gabriel’s Primary School. At the Marriott Beach with students of St. Margaret’s Primary School. Dinner at the New Thriving Chinese Restaurant.